Max’s Judge’s beer prayer is a beautiful thing and reminds us all what this site is meant to be about when Max can get off Maxim. Now, the Royal Society for the Protection of birds has the Avocet as its symbol. Everyone in the UK knows the logo, pretty much nobody knows it is an avocet. 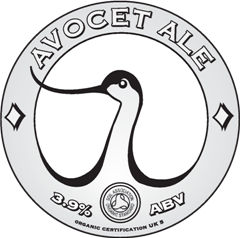 Now, Avocet beer is a similarly rare thing, in need of protection from another RSPB — Really Strange Pints of Beer! It is described as ‘3.9% ABV – Devon’s original organic real ale. A distinctly flavoured beer, with a refreshing citrus taste and an attractive aroma’, but I have sampled it and declare here that it is the weirdest beer I have ever had. Very distinctive, it has a leather, blue cheese and ashes aftertaste. An acquired taste, it is probably the Laphroaig of beers. Nose: Maritime, smoke and ash, peaty, caramel, notes of citrus and ginger. Palate: Big smoke, lots of dried citrus fruits, maritime. Finish: Long, smoky flavours, vanilla notes. Plus Stilton cheese !!!!!!!!!!!!!!!!!!! !